Posted May 1, 2010 by Abaumer in Young Life. Comments Off on Camp LUSHOTO!!!!!!!!! Okay so now it is time to get caught back up, which actually means events from before we were home. At the end of March, we got to be a part of the first ever International School Young Life Camp. Young Life in Africa is focused on ministry with the nationals and having the nationals lead it, however there is a small nitch where international people are able to come over and do Young Life. In many African, and other countries there are international schools. These schools are generally for the children of diplomats, UN workers, NGO workers and other people who come from all over the world. Here in Tanzania there are 5 International Schools that have some form of YL at them. Anyways, we have become good friends with those who are leading at these schools and so we came together to plan camp for these kids. Along with their kids we took a group of Wyld Life Leaders from HOPAC. In total we had about 40 kids. The camp took place in the mountainous town of Lushoto. Austin and I packed in a bus with 20 HOPAC kids. Inevitiably the bus broke down multiple times and it poured rain so it took much longer but I was impressed with the fact that the kids did not complain at all. You can tell they have all been in Africa for a while. These kinds of things don’t phase them. It is simply a part of life they have come to understand. Finally, we arrived at camp. It was held at a beautiful, and secluded lodge far in the mountains of Lushoto. It was cold there so I was more than happy about that! Austin and I did program, which means we dressed up in silly costumes, lead games and sang songs. 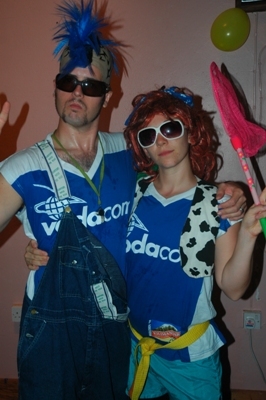 We went as Tanzanian Olympic Goat Herding Champions Cuzi and Suzi Mbuzi (mbuzi means goat in Swahili). The whole weekend the kids were bleating like goats at us which was super funny. We also each lead a cabin of kids. It was so great getting to know some of them better and being able to see them have fun and let loose. We went on a bike ride, went fishing, and did arts and crafts. As a large group we all went hiking to a waterfall. It was raining and cold during that time but everyone still had fun. Most importantly we got to sit and talk with the kids and just be their friends. We talked about dating, and parents, school and faith. I enjoyed our time so much and I know that Austin did too. We are hoping that we will be able to help out with another one of these in the coming year. 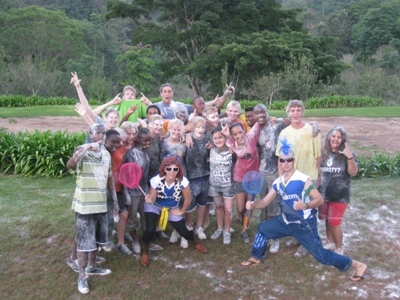 HOPAC kids after some Messy games.